We hope you enjoy your visit to Kul Kah Hanʼs Garden! ✺ Come Stroll our 900 feet of garden paths to see hundreds of native plant species. ✺ Enjoy the textures, colors and fragrances of the trees, shrubs, ﬂowers, grasses and ferns. ✺ Return to witness their changing beauty during different seasons. 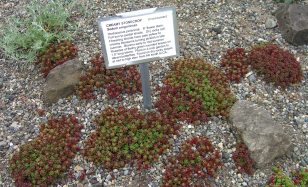 Sedum oregonense. Herbaceous perennial. 6” flower stem. Full sun to partial shade. Dry rocky soil. Flowering shoots have pale yellow to creamy blossoms turning pinkish in late summer. Blooms early to mid summer. Rosettes of fleshy green rounded leaves on 1.5” long stems. Plant in a rock garden to attract butterflies. Found on dry rocky slopes at mid to high elev. from AK south to CA. ecosystem/garden beds on the kiosk board. following the named green signs in the garden. (show photo of green signs) Here you may notice some of the typical characteristics seen in that terrain in the wild. Garden” and read the suggestions. ✺ Print out the Plant Lists from the Garden page of this website and bring them along when you visit. Below: Visit with “FIN” the Migrating Salmon when you stop by HJ Carroll Park!